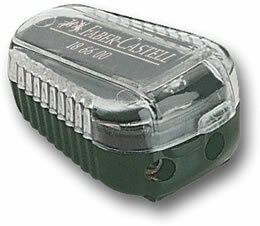 The Faber Castell Twin Hole Sharpener 18 57 10 is made with all the quality and precision associated with German engineering. One hole is set up for graphite and gives a sharp point, the other sharpens to slightly thicker barrel and blunter point more suitable for colour pencils. 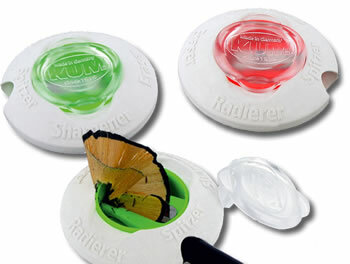 This is the sharpener recommended by Faber for use on their Pitt Pastel pencils and the feedback from our customers confirms this to be true. 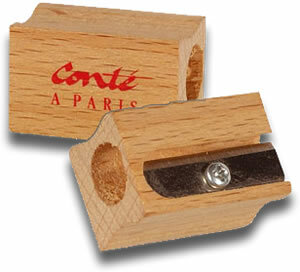 Conte a Paris wooden pencil sharpener is made specifically for the larger barrel of their pastel pencils. The wider gauge hole is fitted with a removable steel blade which is perfectly positioned to be gentle on wider diameter, pastel cores. And of course, being Conte, it looks lovely too. Our spare blades for Kum fit these sharpeners. 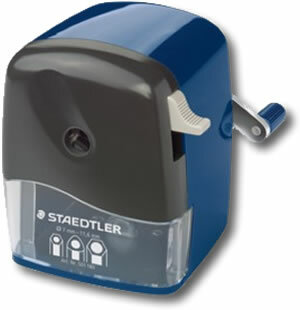 This excellent rotary sharpener fits all types of round, hexagonal and triangular pencil up to 12mm in diameter. 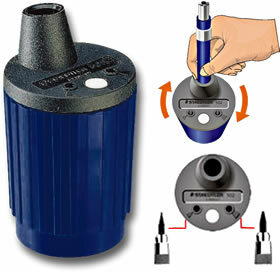 With a point adjuster (sharp & long for graphite and blunt & round for colour) it has an automatic sharpening stop and comes with a desk clamp. This brilliant little piece of kit has a number of impressive design features all packed into a compact size not much bigger than a conventional tub sharpener. 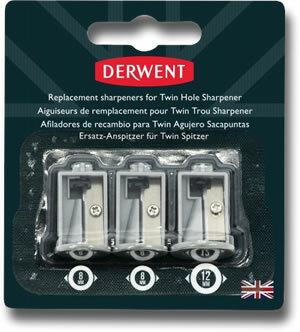 The two holes can handle any size barrel from 6mm to 12mm ensuring perfect and speedy sharpening for graphite or colour cores. 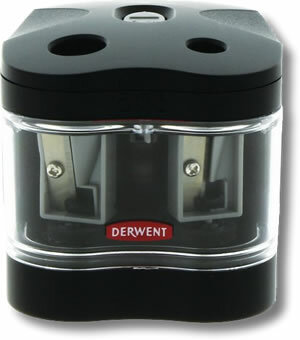 Keep your pencils top notch by replacing the sharpeners in your Derwent Battery Operated Twin Sharpener. 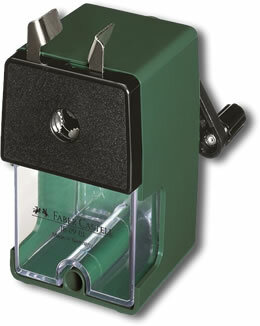 Classic rotary sharpener with handy desk clamp from the excellent engineers at Faber Castell. 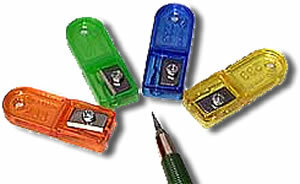 Use the variable point setting to sharpen graphite pencils to a sharp point and colour pencils to a rounded end. 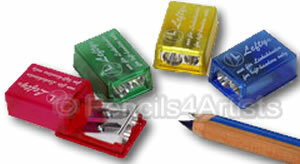 For round, triangular and hexagonal pencils up to 12mm diameter. Keep your 2mm leads at optimum sharpeness with this handy little lead pointer. 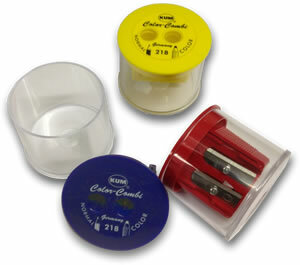 A brilliantly designed little sharpening tub for 2mm leads. Use the smaller holes to set the amount of lead protrusion to give you a sharp or blunter finish then place the pencil in the large hole and spin it round! 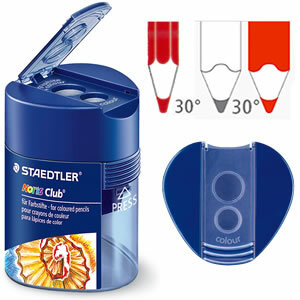 The Stabilo 4514 sharpener is a short cone sharpener with a special blade for high quality colour pencils. 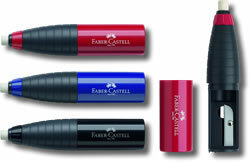 Ideal for the Carbothello pencils and other pastel pencils. 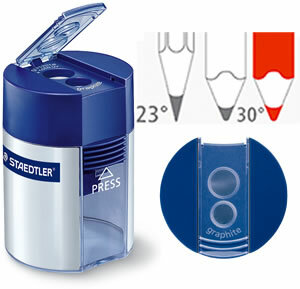 An attractive double holed sharpener that takes both narrow and broad pencils and has a reservoir with a hinged lid to keep everything neat and tidy! 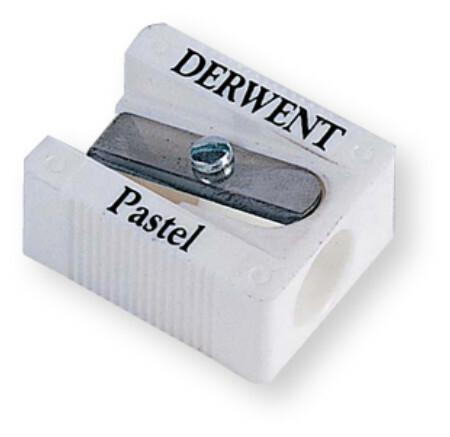 An attractive looking, three hole sharpener for varying pencil sizes. Waste container on both sides. 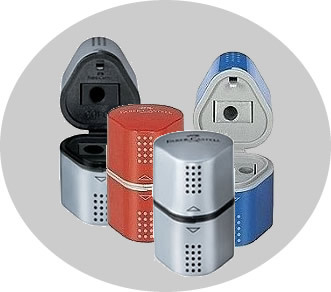 A magnesium alloy pencil sharpener for 8mm and 10mm pencils, with all the precision engineering we expect from Kum. Comes with 2 spare blades. 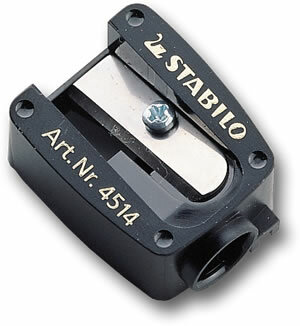 A single holed metal sharpener in an unbreakable ellipse shaped barrel. Comfortable to hold with the usual brilliant sharpener engineering from our friends at Kum. For all standard pencils. Integral container to collect shavings. This fantastic sharpener from German based Kum first shapes the wood first (there is an automatic stop so you can't go too far) and then the lead (with the same automatic stop), giving you an extra long point. 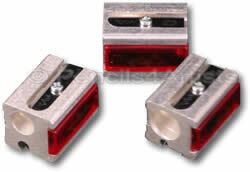 In the same sharpener is a lead pointer for 2mm and 3.15mm leads. The extremely durable helical blade of the Super Point Mini means that all cores can be sharpened to a extremely fine point quickly and easily. 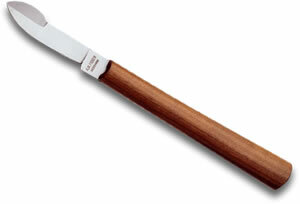 An extendable front plate and self feeding mechanism ensures perfect sharpening every time. 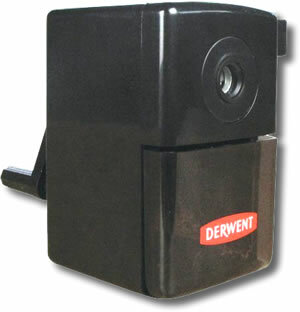 The hole can take barrel sizes from 7mm-9mm which covers all Derwent pencils. 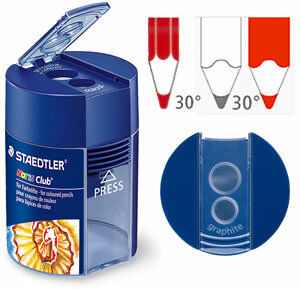 This handy sharpener sharpens standard sized blacklead pencils up to 8.2mm to 23 degrees for precision and thick black lead and coloured pencils up to 10.2mm to 30 degrees for smooth performance. 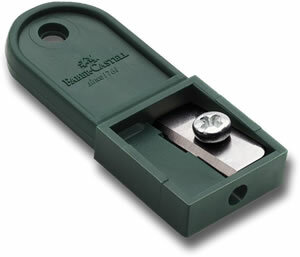 A tub sharpener with a metal sharpener insert. Sharpens standard sized blacklead pencils up to 8.2mm and has a hinged lid to prevent shavings from spilling and the lid has a safety lock to prevents accidental spilling. 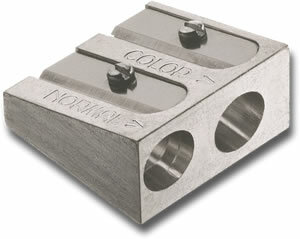 A tub sharpener with metal sharpener inserts. Hinged cover prevents spillage. Not satisfied with being one thing this useful little device is two! A handy eraser on one end and a 'twist to open' sharpener on the other. A must for all artists on the move. The Kum Calypso is that most useful of things - a sharpener and an eraser all in one! 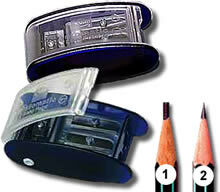 With a standard sharpener in the middle it is surrounded by an eraser. Why carry two items when you can carry a Kum Calypso? 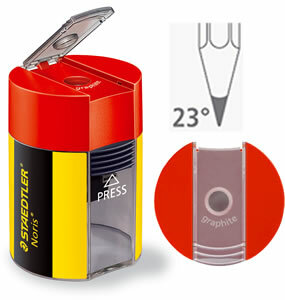 An attractive wooden double holed sharpener, for standard and larger pencils.